Self-taught, Kent has developed a unique style. Similarities have been drawn to Alex Colville in the moods created, and in his use of naturally occurring geometric lines. The clarity of his work also draws a natural comparison to Ken Danby. He has studied the notebooks of Leonardo Da Vinci, which he found of infinite value on how to 'see.' He also holds Rembrandt in high esteem. Kent works mainly in acrylic on canvas, which gives him an excellent combination of styles and techninques that can be used, taking advantage of the quick drying time of the acrylics and the rough but consistent texture of the canvas. The chief objective of landscape art is to capture the presence of the scene, to draw the eye in and keep it there, to create a mood or feeling that leaves the viewer with an impression of peace and tranquility. The combination of accurate perspective and colour with a composition that causes you to look into the scene, rather than just at it, gives the viewer a three-dimensional window into another place - or even another time. 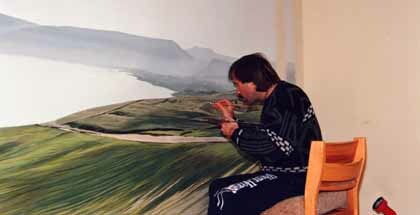 The artist painting the mural "Sea of Galilee" in the Chapel of the Good Shephard, Ramallah, Palestine.